Orion is the Beyonce of constellations. Pretty much everyone has heard of it and seen it (you can even see it in New York despite the light pollution). It’s hard not to like it. And if you spend some time studying its behaviour and meaning, you’ll only appreciate its intricacies even more. So there’s good reason to be excited about this new image of Orion’s second brightest and biggest star, Betelgeuse, taken by the Atacama Large Millimetre Array in Northern Chile. Not only is it one of the crispest images of a stellar surface yet, but it can tell scientists a lot about the massive star’s future. 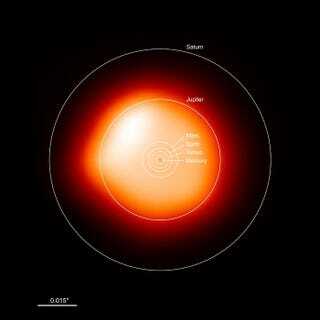 Betelgeuse is a red giant star, but giant is sort of an understatement—its radius is 1200 times that of our Sun, equalling more than the distance from the sun to Jupiter. But it’s losing mass, and scientists want to know why, and how that mass loss will impact the star’s ultimate demise. So they took this image of its microwave emissions on November 9, 2015 using ALMA’s array of satellite dishes. McDonald pointed out that you’d normally expect stars to be spherical, but in this image there’s a lump sticking out of the left side of the star’s surface, as well as bright hotspots, temperature differences on the surface. “We see localised regions of heating taking place in the atmosphere,” the study’s first author Eamon O’Gorman from the Dublin Institute for Advanced Studies told Gizmodo. “We think similar phenomena happening on the Sun are happening on Betelgeuse as well,” which is surprising because of how different the two stars are. This confirms some of the past observations of the star taken with other telescopes, and could be from convection pushing material upwards, sort of the way water moves around when you boil it. And there’s more where this came from; this is certainly the best picture of a star that the advanced new ALMA has taken, but the telescope will soon take a look at other stars as well. Understanding these irregularities and how Betelgeuse loses mass could ultimately help scientists predict the star’s fate. Supernovae are responsible for many of periodic table’s heaviest elements, but which specific elements might come from Betelgeuse’s explosion could depend on the mass loss taking place in the meantime. Ultimately, studying Betelgeuse could help us develop a better picture of how we, and all of the elements that make us, got here.